In the year 2002, when the GameCube entered the European market, Nintendo of Europe introduced the consumer loyalty programme Nintendo VIP 24:7. Nintendo customers of multiple European countries, including the United Kingdom and Ireland, could register their Nintendo products and were awarded points, so-called Stars, for doing so. These could be traded in the Stars Catalogue for merchandise such as soundtrack CDs, figurines and bags, but also for digital downloads such as wallpapers and ringtones. One already got free downloads for registering games which fit the respective game title. With the release of the Wii and the relaunch of Nintendo of Europe�s website, the name of the programme was changed to Club Nintendo, as the Japanese and the later American loyalty programme were also known. With this, the downloads one automatically unlocked for registering games were dropped. And this page is exactly about the long-unavailable downloads of the website. 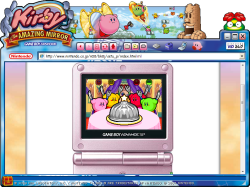 It is intended to make all downloads available here for the five games with Kirby that were released in Europe between 2002 and 2005. Keep in mind that all executable programs (exe files) were created for the Windows versions of the time, such as Windows XP, it is possible that they won't work properly on modern operating systems. Unfortunately, nothing is known to me about the downloads of this game. These four pictures in different resolutions came together with a so-called Wallpaper Changer. Beneath simply changing the wallpaper, the Windows program allows the random selection of a picture from a list for every start of Windows. Every image can be used, it doesn�t have to be Kirby. Unfortunately, I'm not able to offer a properly working version of this programm. At least a screenshot (of the German version) shows the interface. But of course, the colourful wallpapers can also be used without the program, modern operating systems innately offer comparable features anyway. Alternatively, you may use another Wallpaper Change (see game after next). 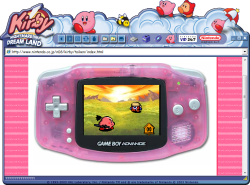 Surf the Internet with a browser in Kirby design. The programm uses the default browser of Windows, the Internet Explorer, as its basis. Besides the usual buttons of a browser, there are also not quite up to date links to the (German) Nintendo website. Originally, there was a setup program for the browser, which I don't have anymore, sadly, but that shouldn't be a problem. The uninstaller found in the ZIP archive only serves the sake of completeness. Please note that this is the German version and therefore the tooltips are in German, but the buttons are self-explanatory. 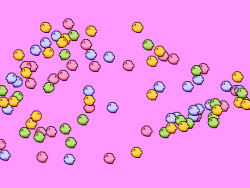 A screensaver for Windows with many colourful Kirbys that are flying around on your screen. The bacgkround regularly changes its colour. Before that spectacle, the logo of the game appears which is inhaled by Kirby. To install the screensaver, you may right-click on the SCR file and choose �Install�. A simple action game which is played in the browser and requires the Flash plug-in. 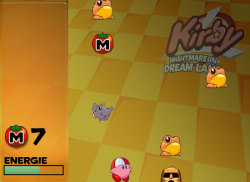 Control Kirby with the arrow keys and avoid the enemies falling from above. The target in every level is to collect ten Maxim Tomatoes. Pep Brews are also of advantage and restore lost energy, while Parasols make Kirby invincible for a few seconds. 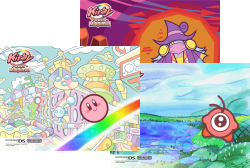 When you have done all levels, you are awarded a Kirby hint sheet in PDF format. For these downloads I�m missing any information, too. The gifts for the registration of this game are available on Kirby's Rainbow Resort. 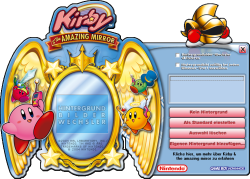 This (German-language) program for Windows works like the Wallpaper Changer for the other GBA title. But for this one the installation program is also still available. 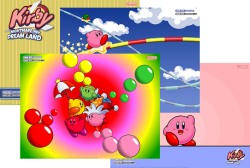 It comes with three more wallpapers featuring Kirby & Co. in different resolutions. Maybe even this application fails to work on current Windows versions, but of course the image files are useable with all common operating systems. Therefore, an archive only containing the images themselves is also avialable for download as an alternative. 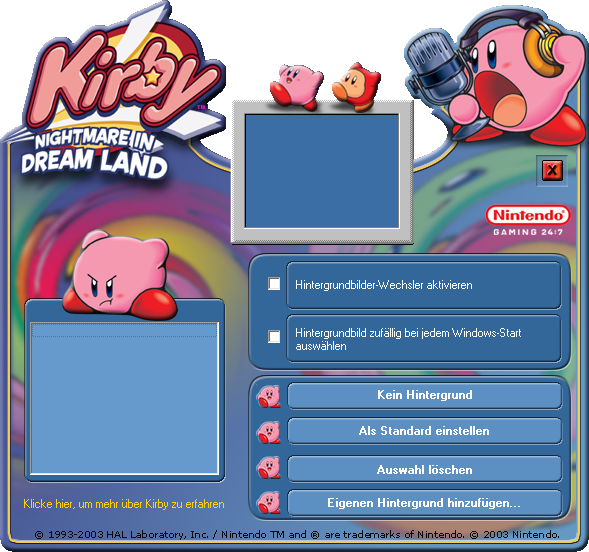 Another Windows browser in a colourful Kirby design. Besides the layout, this application is basically identical to the previous browser. A screensaver for Windows that perfectly fits the game. 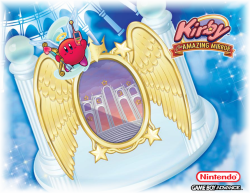 Watch as many different inhabitants of the Mirror World as well as the Kirbys come out of the mirror and whiz over the screen. Some files found on Kirby's Rainbow Resort are most likely those that one got for the registration of the DS game. But possibly these are not all of them. Three imaginative backgrounds from the game as desktop wallpapers in two different resolutions each. Artwork of ten different enemies as 100x100 pixel JPG images, which may be used as user pictures for example, and as classic 32x32 ICO files. Whoever knows about the missing downloads, please contact!